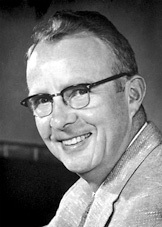 Luis W. Alvarez was a Nobel Laureate Physicist with a long career as a creative and innovative scientist. 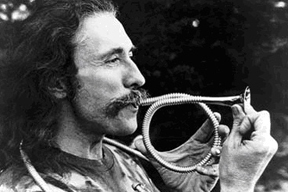 Known as Luie to everyone, among his many productive years was a period at the Lawrence Berkeley Laboratory during which he developed the high-energy particle detector known as the hydrogen bubble chamber and pioneered the use of digital computer technology to analyze the photographs that it produced. ...for his decisive contributions to elementary particle physics, in particular the discovery of a large number of resonance states, made possible through his development of the technique of using hydrogen bubble chamber and data analysis. Using many of these same computer-based data analysis techniques Alvarez also organized and directed a large and fruitful effort in detecting and investigation of both cosmic rays and electromagnetic radiation at high altitudes. 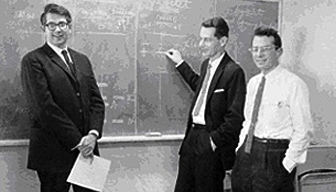 Alvarez led a group of other physicists, graduate students, engineers, and technicians known originally as the Alvarez Group and later as Group A. The intellectual work of this group was recorded in three levels. The first and highest level was the publication of articles in the physics journals, primarily Physical Review and Physical Review Letters. The second and less formal level was in printed reports known as University of California Radiation Laboratory reports, or UCRL's. These were printed and distributed by the Lawrence Berkeley Lab (known then as the Lawrence Radiation Laboratory). Among the UCRL's were the theses of the scores of students who got their Ph.D.s in the Alvarez Group. The third and lowest level of formality was what came to be known as Alvarez Group Memos, which were the working papers of the group. They were written by almost anyone — physicists, programmers, engineers, technicians — often handwritten particularly because the symbols were difficult to type, though many were more formally typed. They cover a wide variety of subjects and provide a fascinating look at the working level of science during this two-decade burst of creativity. Though the memos were informal in the sense of presentation, they had an extremely rigorous system of review as they were read and digested by all of the other group members who might be interested in the subject, and who were definitely not shy in providing critiques of the work. They were a particularly good tool in the training of graduate students — both an opportunity for original scientific writing and a requirement to defend the work against the queries and comments of these knowledgeable readers. Many of the memos were highly pedagogical in content, usually the result of a graduate student or a physicist working their way through a problem, and then writing it up for readers to use as a guide. Popular topics were relativistic kinematics of two-body and multi-body interactions, angular-momentum expansions into partial waves, and the design and layout of particle beams. Even topics perhaps considered elementary, such as the calculation of cross sections become quite complicated when you are doing it "for real" and not just for a homework problem. Janos Kirz's long Physics Memo 640 on how to handle the details of cross-section calculations was probably much appreciated by later students. Memos were organized, and usually typed by Luie's long-time secretary Ann McLellan, who assigned numbers and kept the original copies. Distribution to various interested parties was left up to the author, but any copy of any memo was available from Ann. Physics is a competitive business, and some memos were marked Not For Distribution to protect ideas or concepts, but in practice most of the documents were widely distributed both by visiting scientists and simply by ignoring the NFD legends. There were, of course, many memos of interest only to group members because of their content, often the detailed nuts and bolts of the complex business of actually doing high energy physics. Over the years several other sets of related and supporting memos were created, and we have also preserved their images on this site. Engineering Memos, Programming Memos, and HAPPE Memos are included here. The Engineering Memos are particularly interesting because they were done very early during the development of the small 10-inch and 15-inch bubble chambers, and they also document some of the earliest efforts in automating the data analysis. As the very first hurdles were encountered in using the bubble chambers, they were documented along with their solutions. These include the first memo on a kinematic fitting computer program, by Lynn Stevenson, and the first Scanners' Instructions, by Art Rosenfeld. These Engineering Memos are precursors of the Physics Memos and were replaced by the later series. Programming Memos were written by anyone who had an interest in documenting and explaining their computer work, and tend to parallel the Physics Memos. 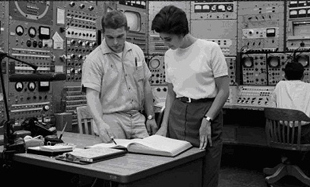 In addition to the physicists, graduate students, and technicians who were using computers to solve data analysis and engineering problems, the Alvarez Group had a staff of professional programmers who tended to concentrate on larger and broader programs for the benefit of all, as opposed to the scientist's more narrow focus on particular experiments and the details of certain data sets. With the development of compact mini-computers the group pioneered using them to control dedicated pieces of hardware, and some of the memos in this collection are pointed toward describing these developments. In 1964 Alvarez proposed what became know as the High Altitude Particle Physics Experiment, or HAPPE, originally conceived as a large superconducting magnet carried to high altitude by a balloon in order to study extremely high-energy particle interactions (see Physics Memo 503). In time the focus of the experiment changed more toward the study of cosmology and the role of both particles and radiation in the early universe. This work was an early precursor of the satellite-born experiments on the background radiation, which resulted in the award of the 2006 Nobel Prize; shared by George Smoot and John Mather. Here we have included the set of 338 memos which cover through early 1977. Nor were all of the memos necessarily about particle physics. Robert Golden, together with Alvarez and Dave Judd of the Theoretical Group, wrote Physics Memo 502, The Electrostatic Potential of the Earth and the Moon. After receiving his degree, Golden joined NASA as a scientific astronaut candidate and had a career in astrophysics. Stan Flatté wrote Physics Memo 536, Polar Rise and Equatorial Fall of Sea Level. After completing his graduate work, Stan Flatté became a Professor of Physics at UC Santa Cruz specializing in global oceanography. It is interesting to see how the authors changed over time. The early memos were written in the very first days of bubble chamber physics. Frank Crawford and Lynn Stevenson were frequent authors. Later on with the maturity of the 72-inch and 82-inch bubble chambers, there were contributions by many authors. Late in the 1980's much effort went into the development of the TPC detector and Philippe Eberhard wrote many of the memos. Lynn Stevenson wrote Physics Memo 3 and also Physics Memo 965. The Alvarez Group Memos span a period of 39 years, from 1951 to 1990. Searchable indices are provided which contain date, title, and authors. The memos are in PDF format and may be viewed or downloaded in groups of 10 per file. The photos in order, show Luis Alvarez; Sheldon Glashow, George Kalbfleisch, and Arthur Rosenfeld; Lynn Stevenson; a Bevatron Operator and Lina Galtieri; Arthur Rosenfeld; and Frank Crawford.